Ethiopian Airlines announced that it has received its fourth B777-200 LR Freighter on 19 November 2014. 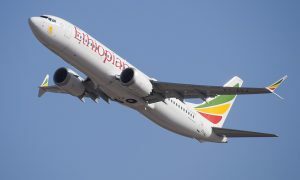 Ethiopian was the first in Africa to receive and operate the B777-200 LR freighter on 19 September 2012 and is still the only African operator of this modern aircraft. 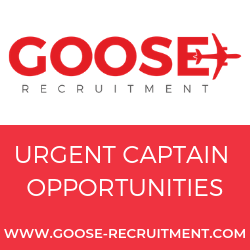 The aircraft, which has exceptional uplift, range and fuel efficiency, is perfectly suited for the transport of Africa’s growing import and export freight. 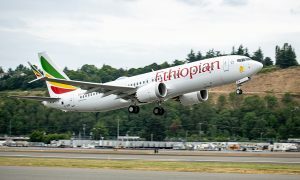 In line with the country’s plan to enhance the export of horticulture and floriculture products and the airline’s vision 2025 strategic road map, Ethiopian is not only expanding its fleet capacity and cargo terminal but also replacing its old aircraft with the most latest and environmentally friendly airplanes with large capacity. The Boeing 777 Freighter is equipped with GE90 series of engines which is the world’s most powerful turbofan and largest commercial engines. The engines are fitted with first ever composite fan blade in commercial aviation on the GE90. This uniquely curved blade design is lighter, more aerodynamic and larger than traditional titanium blades. The lighter blades reduce the weight of the engine and help lower fuel burn which in turn increases capacity contributing to the performance and efficiency of the aircraft. “Our operation of new-generation, high performance aircraft and building one of the largest cargo terminals in the world reflects our commitment in expanding and improving our cargo service to support the exponentially growing imports and exports of our country in particular and the continent in general,” said Mr. Tewolde Gebremariam, CEO of Ethiopian. 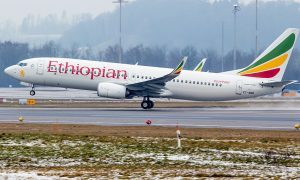 Ethiopian Cargo, the largest cargo operator in Africa, currently flies to 24 freighter destinations in Africa, the Middle East, Asia and Europe using 9 dedicated freighters, including the longest range twin-engine freighter B777-200 LR as well as MD-11 aircraft.